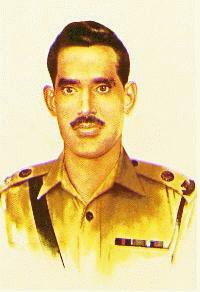 Major Muhammad Akram Shaheed (Nishan-e-Haider), He was born in 14th April 1938 in Dinga City, District of Gujrat – Punjab. He belonged to the famous family of east Punjab called Qazi. He was commissioned in 13th October of 1963 in Frontier Force Regiment. Major Muhammad Akram and a company of the 4th FF Regiment which he commanded in the forward area of the Hilli district, in East Pakistan in 1971, came under continuous and heavy air, artillery and armor attacks. But for an entire fortnight, despite enemy superiority in both numbers and fire power, he and his men, in near super human ability, repulsed every attack, inflicting heavy causalities on the enemy. Major Muhammad Akram got Shahadat during this epic battle in 1971. Major Muhammad Akram Shaheed was awarded the Nishan-e-Haider, Pakistan’s highest military award. It is the highest military award given by Pakistan. It is posthumously awarded to military personnel for extraordinary courage and valor beyond the call of duty in face of adversity in defense of the motherland. There are only a very few parallels to the Nishan-e-Haider in other militaries in the world because being killed in the line of duty is a condition-precedent for the award of Nishan-e-Haider. Its exclusivity may be gauged by the fact that in over 3 major wars and 1 major conflict fought by Pakistan, only 10 Nishan-e-Haider’s (and one equivalent) have been awarded. Dinga is an old town. There is evidence that this town was established in the 16th century. Before the partition in 1947, Muslims, Hindus, and Sikhs used to live here in harmony. There was a Gurdwara for the Sikhs called NanakSar. According to some books, Dinga was the property of a rich lady, who belonged to the sub-caste “Ding” – which is a sub-caste of the Gujars. This is why the town was named Dinga. The population of Dinga in 2002 was 36,800. The telephone area code of Dinga is 0537. The postal code of Dinga is 50280. The easiest way to reach Dinga from abroad is to fly in to the airport at Islamabad, and then take a bus or some other means of transport to Dinga. Dinga is about 135 km from Islamabad. It takes 2 hours to reach Dinga from Islamabad by road and 3 hours from Lahore. To reach Dinga from Islamabad you will travel on Grand Trunk (GT) Road – the main highway that runs from Rawalpindi to Lahore. At the city of Kharian on the highway, you will take a right turn onto Rasul road towards Dinga. Dinga is about 25 km from this point, which would take about half an hour to reach. The condition of the GT road from Rawalpindi/Islamabad to Kharian is excellent, and the road from Kharian to Dinga is reasonably good for travel. Alternatively you can fly to Lahore Air-port, take a bus to Kharian city , in this case you will trave from Lahore to Islamabad on same GT road. From Kharian city main bus stop you will easily find a sub-road to Dinga City. Dinga is a city of Gujrat District in the Punjab province of Pakistan. It is located at 31°57’34N 74°28’57E at an elevation of 218 metres and lies between the rivers Jhelum and Chenab. The main highway that runs from Lahore to Rawalpindi is about 25 km northeast of Dinga. Dinga is about 100 km from the border that separates Pakistan and India, the city is famous in Pakistan for meethi saunf (sugar coated aniseeds). Dinga is an old city. There is evidence that this town was established in the 16th century. Before the partition in 1947, Muslims, Hindus, and Sikhs used to live here in harmony. There was a Gurdwara for the Sikhs called NanakSar. There are still the ruins of pre partition buildings here. The population of Dinga in 2008 was about 80,000. The city of Dinga is part of Kharian Tehsil (a subdivision of Gujrat District) and is administratively subdivided into two Union Councils, Dinga-I and Dinga-II. The easiest way to reach Dinga from abroad is to fly in to the airport at Islamabad, and then take a bus or some other means of transport to Dinga. Dinga is about 135 km from Islamabad. It takes 2 hours to reach Dinga from Islamabad by road and 3 hours from Lahore. Dinga is connected to Islamabad by the Grand Trunk Road – the main highway that runs from Rawalpindi to Lahore. At the city of Kharian on the highway, you will take a right turn onto Rasul road towards Dinga. Dinga is about 25 km from this point, which would take about half an hour to reach. The condition of the GT road from Rawalpindi/Islamabad to Kharian is excellent, and the road from Kharian to Dinga is reasonably good for travel. An alternate way to reach Dinga from India is to fly in to the airport at Sargodha (which is due southwest of Dinga), and then take a train or some other means of transport to Dinga. If you feel that you can provide us more information to share it online, please contact us.